Gondorian, one of Shadow Era‘s developers recently released a preview of the upcoming balance changes for Shattered Fates (version 2.89). While there are many proposed changes, I would like to address them in pieces. First up, Hello Hero! Many of the changes in 2.89 seem to be aimed at making seldom used and underpowered new heroes somewhat better. There is a general consensus that right now Ythan, Skervox, Praxix and Raikka are in need of some love. They have interesting abilities, but are lacking in many important ways. 2.89 offers some promising changes for them. Ythan can do some scary things with double attacks and buffs when he gets a strong board…but he can also lose that board. Ythan is generally regarded as a weak hero. 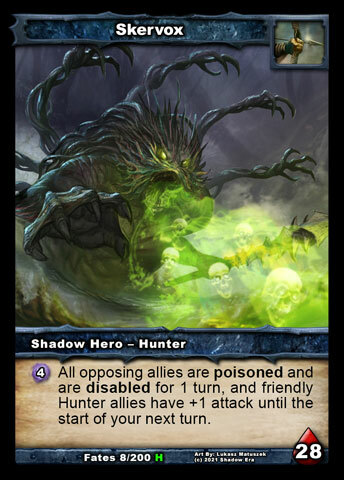 One of his main weaknesses is that as opposed to all of the other hunters, his ability does not help him to reclaim the board once it has been lost. This means that it is particularly important for Ythan to be able to keep the board. This change allows more flexibility in doing that. Ythan now has unique strengths against rogues and Moonstalker, who tend to abuse stealth in order to contest and reclaim the board. Hopefully having those strengths will allow Ythan players to carve out a niche for themselves. With enough help from hard to kill allies and haste, the hero may actually see some competitive play. Ythan will also become an automatic counter to the infamous Millstalker decks, as he can easily bypass Moonstalker’s ability and wear down his health over time. If Ythan is competitive enough to see regular play, we may be seeing much less of Millstalker. Ythan will still have difficulty reclaiming the board once he loses it, but perhaps with a strong enough early game, this will be acceptable, just as Garth is able to remain competitive with a 3 SE ability that helps his allies kill opposing allies, but does little to help him contest a board that he has lost. Now Garth will remain stronger against armored allies, while Ythan will be stronger against heroes and allies with stealth. It may still require extra cards in the next expansion for Ythan to be competitive, but he certainly shows some promise now. Skervox is another hero that is generally weak. 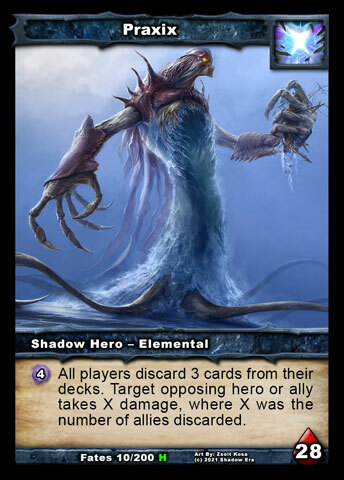 Popular approaches to Skervox have often emphasized spamming his ability, fueled by Shadow Font as a sort of stall deck. These decks essentially function like Millstalker, but are slightly more limited, as they are only strong against decks that require allies to win. The similarities to Millstalker make playing against these decks a Negative Player Experience (NPE), but the limitations make it not versatile or consistent enough to be competitive. The challenge for developers becomes buffing Skervox to be competitive while not encouraging people to play stall decks. The 2.89 change reflects that intent by making Skervox better at playing hunter allies. 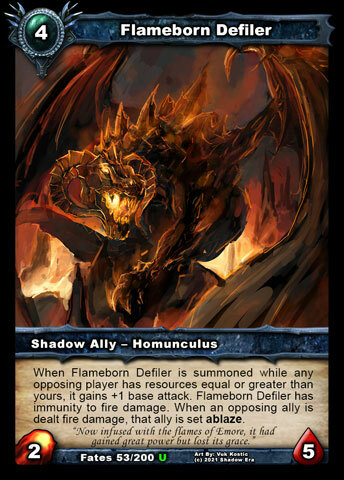 Such an ability will strengthen Skervox and encourage people to play decks that use allies, rather than abusing powerful items. We will probably be seeing more decks like Turbo Skervo, which are fun to play and play against, and really show off the potential of this interesting hero. Who needs items and abilities? Praxix may be able to take advantage of ally based utility, hero ability burn and discard effects to make a heavily ally-based deck. Praxix is a weak hero in need of a buff, and you don’t want to make mill too strong, so how can you buff him? Apparently the approach taken here is to give him an alternate win condition. The design team is trying to give players options where they can play Praxix with the aim of controlling the board while milling the opponent, in which case this buff gives a slight improvement to Praxix’s ability to control the board. Alternatively, Praxix players can now aim to do damage to heroes, with the mill ability being used to interact with other cards that benefit from discards while doing damage to the opponent. Removing the restriction on damage allows for that player to potentially deal 6 damage to the opponent with one activation of his ability, although he needs some luck, and an ally filled deck to achieve this. This corresponds to an aggro play-style, similar to many popular Elementalis decks, with some added synergies with discard and more direct damage. This underused card represents some interesting potential. Now it gives extra options in terms of utility to elemental decks in general and particularly Praxix mill decks. The fact that this card now includes a mill and an optional ability to return cards from the graveyard onto opponent’s deck gives additional strategic options. I can envision 5 potential uses for Redux channel now: pure mill, discard, disruption, stealing and burn. As a mill card, Redux Channel can be used against the opponent to discard cards, and then cancelled without returning cards. Milling an additional 2 cards may not seem like much, but if you can play 3 of these in a game, that brings you closer to your win condition much sooner. 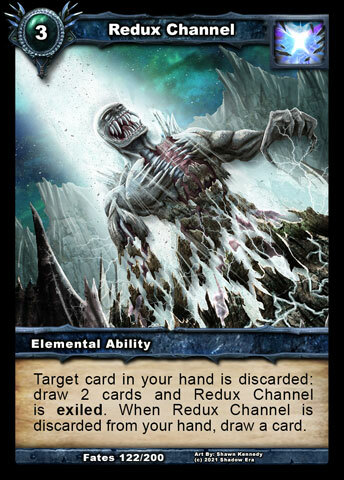 Redux Channel also triggers other cards that benefit from you discarding, these include Reactorary and Reverberate (among others), Praxix has many ways to trigger such effects, but being able to do so every turn can certainly be helpful. One of the uses that I am most excited about for Redux Channel is disruption. It should be possible for Praxix to mill opposing cards and then use Redux Channel to seed the top of the opposing player’s decks with non-optimal cards from the graveyard. If I ensure that the next two cards my opponent draws will be artifacts that are already in play, or allies that are easy to kill, it removes pressure for me, while I save up shadow energy and cards for my mill strategy. It may seem like it hurts my win condition to put cards on the opposing player’s decks, but it may be helpful as a stall strategy, which is certainly an important element of many Praxix decks. Redux Channel can be used in combination with cards like transference and Dimmension Ripper to steal specific cards from the opponent’s graveyard. Many people think that this usage of the card is probably too cute (an overly complex combo that isn’t strong enough to be worthwhile). However, if you’re going to use the card, you may find chances to use Dimmension Ripper while you’re at it. Lastly, this card can be used purely to enhance burn. If my opponent has 6 hp left, I can use Redux channel to do 2 damage to that opponent, while placing two allies on the top of their deck. 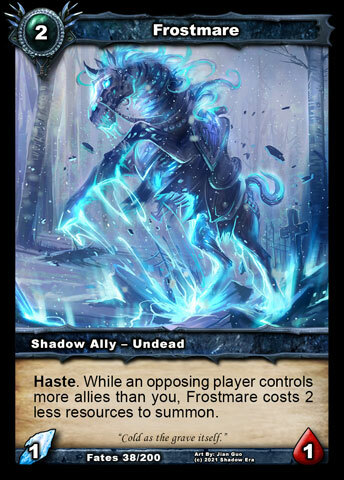 Then I can use Praxix’s ability to discard those allies, which allows Praxix to deal an additional 2 damage. It is possible that Praxix could’ve done that damge without this card, but it does provide some certainty. You can be certain after using this that his ability will deal at least 2 damage, and possibly as much as 6. In this way it can operate as a sort of probabilistic fireball, capable of doing anywhere from 2-4 damage, depending on the difference between the certain damage it grants you, and what you would’ve done without it. There are a variety of new options open to Praxix, and some promise for his power in upcoming sets, as discard-based mechanics continue to expand. I’m excited to see what sorts of interesting decks spring from these changes, and to see some Praxix players move away from the mill and embrace the old fashioned death race, or perhaps a disruption-based control deck. 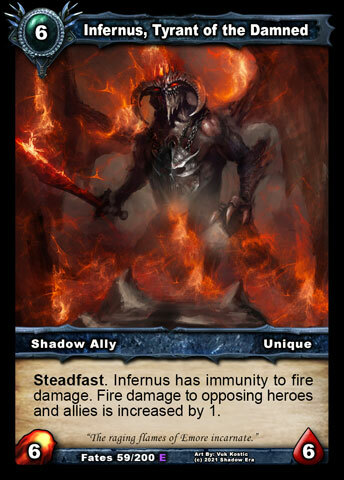 Infernus, Tyrant of the Damned: Ability changed to: “Steadfast. Infernus has immunity to fire damage. Fire damage to opposing allies is increased by 1.” (from “Steadfast. Fire damage to opposing allies is increased by 1.”). Although I would argue that both of these are buffs to Majiya and Gravebone, they may also have some synergy with Raikka and decks that revolve around dealing fire damage and drawing with Flameforged Gauntlets. I don’t believe these slight changes are going to put Raikka anywhere near Tier 1. Indeed, if fire immune Gravebone decks become popular, it may hurt Raikka a lot (since her ability causes allies to deal fire damage). I think Raikka will probably remain a hero with potential that just needs a few cards to get better (like Logan or Jericho). In Raikka’s case I think the cards will be weenie allies with haste or other interesting abilities. Until we see those, perhaps these new changes will at least give Raikka players some things to play around with.